Planning kilnformed glass projects requires a lot of imagination because glass changes when it is fired. It changes in texture, reflectivity, and color. A design that seemed like a good idea at the start, often does not come out pleasing at the end. One method I have found that helps me be able to visualize the appearance of the projects after firing, is the creation of a sample set. 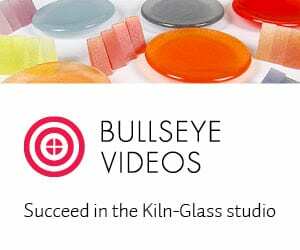 I use Bullseye glass, and they make very nice sample sets for kilnforming. 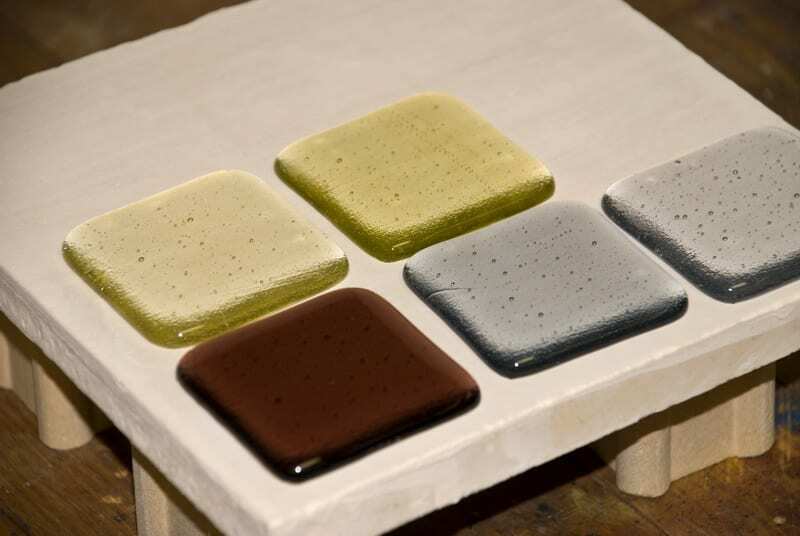 These sets have a 2″ square of each color, and show the appearance of striking glass after firing. 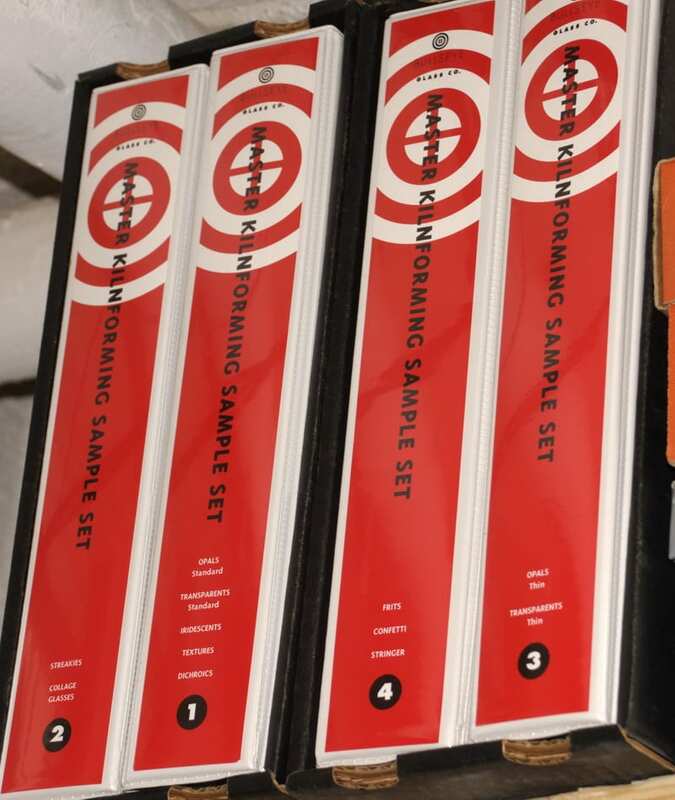 As Bullseye adds new colors, sample set updates are available. I have this sample set, and use it extensively to help me purchase glass. But, I don’t find it helpful for designing my projects. 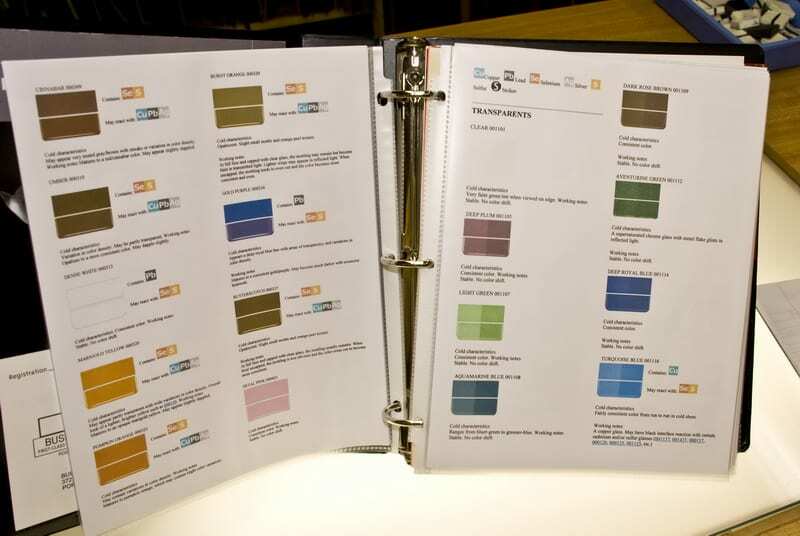 This is what the inside pages of the sample set look like. 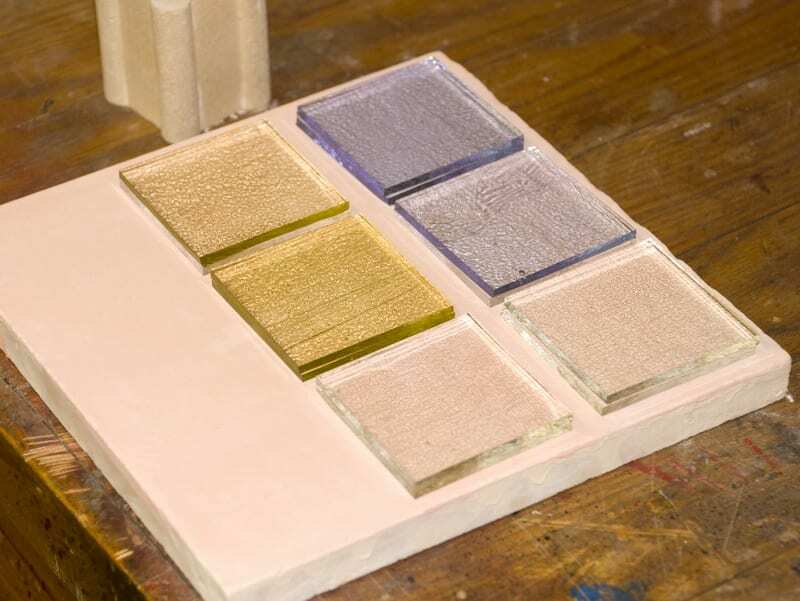 So, over the years, I have made a secondary sample set that shows the appearance of these colors after fusing. 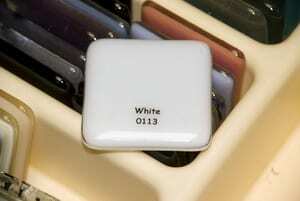 I’ve found that plastic silverware trays are the perfect way to store these 2″x2″ samples. The one pictured on the banner of this page even has a rubber bottom on the inside to keep them from slipping. I’ve found that a 2″ square is a good size for this. I lay the colored glass on a 2″ square of clear glass and fire to full fuse. I have a small Paragon SC-2 kiln that is perfect for those situations where I only have a couple of new colors to add to my set that day. Or, these can be placed on any spare real estate on a kiln shelf during firing of another project. I have made samples of all my commonly used colors, and add new samples every time I get a sheet of a color I haven’t used before (which seems to happen with every new crate of glass). I then add labels indicating the name of the glass, as well as it’s number designation, and any other necessary information. I’ve found that clear labels work very well, and can use my computer and printer, or a dedicated label-maker. 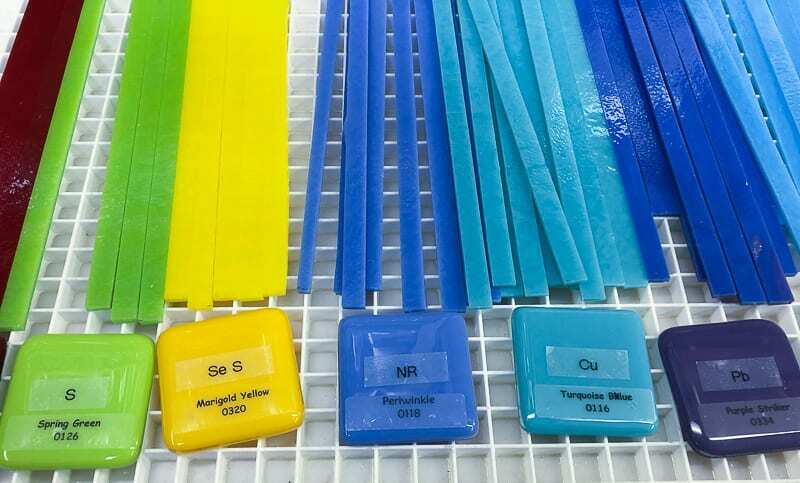 I label the color and number of the glass, and if it is a transparent color, if there is more than one layer of the color in the sample. You might want to also make some combination pieces, depending on what kind of work you make. I am often making 3/8″ thick strip cut pieces using tints. So, I make a sample with one layer of tint, and another with two layers of the tint. By combining samples, I can see how one, two or three layers of tint will look. What you decide to do will depend on the kind of work you create. Rarely do I start a design without laying out samples to help me visualize the colors and textures. 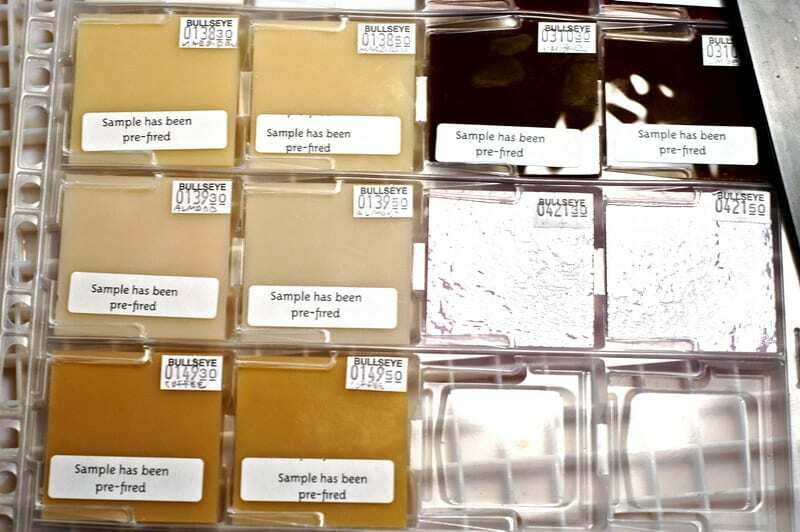 Samples with the name, reference number and chemical composition are very helpful when creating complex creations. 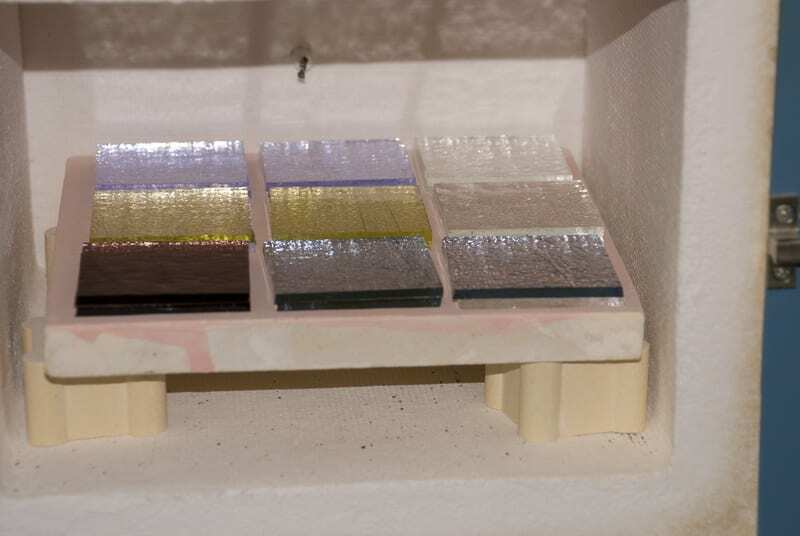 Note the color difference between the Purple Striker sample and sheet glass on the right. You may want to add additional information on your labels regarding chemical reactivity. I have recently started doing this, using the information from the Bullseye web site regarding the characteristics of each glass. I’ve printed this out, and I keep this handy, and make sure that I am aware of any potential reactions from adjacent glasses.